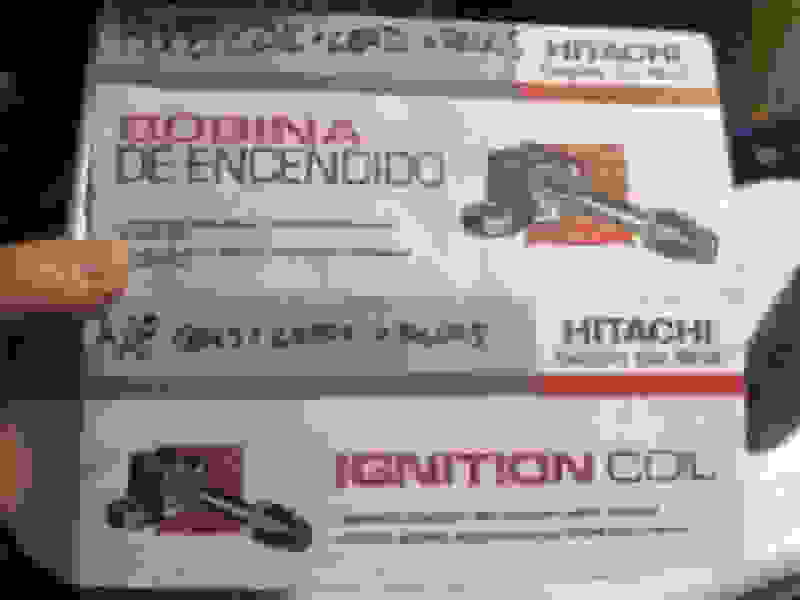 How do I know if I need new ignition coil? The BHR ignition kit is perhaps the most installed, run and proven RX8 aftermarket system of any used by RX8 club members. I bought coils for 25 bucks each with 3 years warranty (fail = replacement), NGK cables for 50 bucks and plugs for another 100 I guess. 250 bucks complete. I don't see where spending another 400 bucks would benefit me more. I checked the resistances of the new cheap coils and there were equal and precise. My original coils showed pretty much the same resistance, but replaced them anyway, because the car has driven already 100.000km on them. One thing that owning seven rotary vehicles (street and track) over 44+ years has taught me, you will ultimately lose if you "cheap" out your ignition with a rotary engine. Topgrade ignition is so critical in these cars, and any weak link in your ignition can cost you a cat and/or an engine, costing your thousands. And more quickly than you think. No way you had top performance with your original coils at 100,000 km. And you probably have done some engine and/or cat damage with coils that old. No Mazda coils, even the latest "C" coils are made to last that long without replacement. With coils you usually "get what you pay for". I don't know what coils you got for $25: Here are the Rx8clubs recommendations. - The Cheapest option: BWD/Intermotor coils from auto parts stores like Advance Auto. 4 coils, 4 plugs, and 4 wires can be had for around $190-220 total based on whatever promotion is running at the time, shipped to your door for free. They are considered to be the first coil revision and you should expect to need to replace them around 20,000 miles, 30,000 miles max. They often come with a "lifetime warranty" by the auto parts store, which could potentially be leveraged for perpetually new coils. - The For-Sure OEM: Mazmart sells all 4 coils of the latest OEM coil revision (C) for around $250, (just the coils, you still need to add plugs and wires) Supported by top notch customer service. They will likely last longer than 30,000 miles, but we don't have much solid data on how long the latest coil revision will last. - The Most Expensive option: Buying from a dealer will run you around $300+ for the coils, $500+ for coils, wires and plugs, and if you have them do the install, expect to get a bill for anywhere from $700 to $1,800. You may not get the latest coil revision. Yes, you are getting shafted if you take this option, so bring lube. - The Highest Risk option: Ebay coils continue to pop up as counterfeit, mislabeled, dead on arrival, and have zero post-purchase support largely. They are the "cheapest" listed price, but when you add that $92 or whatever to the price of anything in the list above from having to do it over again, you can see that they are no longer the cheapest option. Do it right the first time. "Motor King" coils are popping up at an attractive price on Ebay, but are being proven as ineffective, to the point of being unable to get the engine fired. 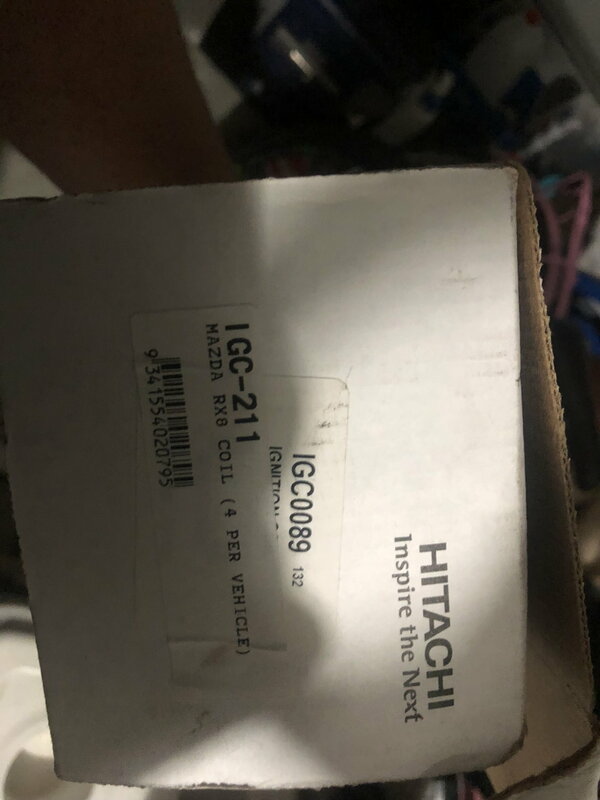 "Mazda" branded coils on ebay are almost always counterfeit. Check the seller's name though, since some of our vendors sell legitimate coils there. The price will be $200+ though. Anything sold as "Mazda OEM" under ~$26 per coil should really be considered as suspect and probably counterfeit. Be wary of "LSx D585 coil upgrades", as not all D585 coils are created the same, and the standard generic D585 coil is not properly designed internally for the RX-8's ignition needs. They generally "work", but there are anomalies and performance issues that have to be solved, if they can be solved. Definitely NOT a plug and play option, even if it is advertised as "plug and play"
And relying on your $25 coils' warranty is risky. If your cheap coils fail, you can do damage to your cat and/or engine, long before you notice enough and long before you get warranty replacements. Why take the risk on cheap coils! That is just being pennywise and pound foolish ! Personally for me, I have over seven years of use with my BHR coils and wires. They have worked perfectly from day one through the present,with no worry and no replacements needed. I periodically change my plugs (12-15k miles or so, for my style of driving) and that is it. Last edited by gwilliams6; 04-03-2017 at 09:26 AM. It taught me to ask, You want to come work on my car? if you have that much experience and such, I need you when I pull my engine and replace parts, especially since I cannot get Charles to come up and hang out. Man, they really screwed up the original engine!!!! "The Original Engine" as sold to NSU by Felix, was the DKM 54 - and spun the housing, AND the rotor, inside a circular block. Check the Wiki. It is a 'better' design, being naturally balanced and allowing a single rotor and much higher RPM. Unfortunately the sparkplugs/ignition rotate with the housing, making it impractical. (Until that laser sparkplug thing is perfected? From what I understand, the Wankel was only intended to be an air compressor and it was Mazda who turned it into an internal combustion engine. Since then, the regulatory environment has changed and Mazda have done all they can to keep the rotary engine relevant but it is proving to be quite a challenge. Have you e-mailed me about a trip to visit you? 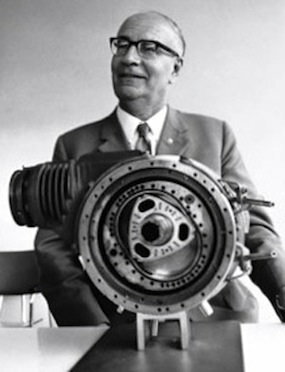 "After NSU officially announced the completion of the Wankel rotary engine in late 1959, some 100 companies around the world rushed to propose partnerships that would get the engine inside their products. Mazda, the Japanese automaker, signed a formal contract with NSU in July 1961, after receiving approval from the Japanese government." It was originally in a motorcycle! Now Charles, I hope you know you are always welcome to come up and over to visit. We can make room for you and show you around a bit. Take you on a road that will blow your mind, too! However, you would be slummin' it. Besides that, I couldn't afford to have a professional work with me much less all the parts I might need right now to make this car run new again. Power of prayer has kept it moving strong though! I read how people spend this and that on their car and "take it out of storage" and I just think to myself, They don't have three children, two dogs, wife, the student loan debt and lack of income I have. Please do not think I am complaining, because I am not, however, I am willing to be more 'economical'. I shall email you about it but you might want to bring the 8 as well. Just wanted to chime in, somewhere. I've been poking around the forum for a few years. I have an '08 with 72K miles and quite frankly, love it. Last fall I had a CEL and determined it was a coil. Replaced the one that threw the code and light stayed off. But car was sluggish up to about 5k rpms then ran fine above 5k rpm's, so I just garaged it for the winter. Since I chose to drive about 12 miles with CEL, I assumed it might be the cat causing the problem. 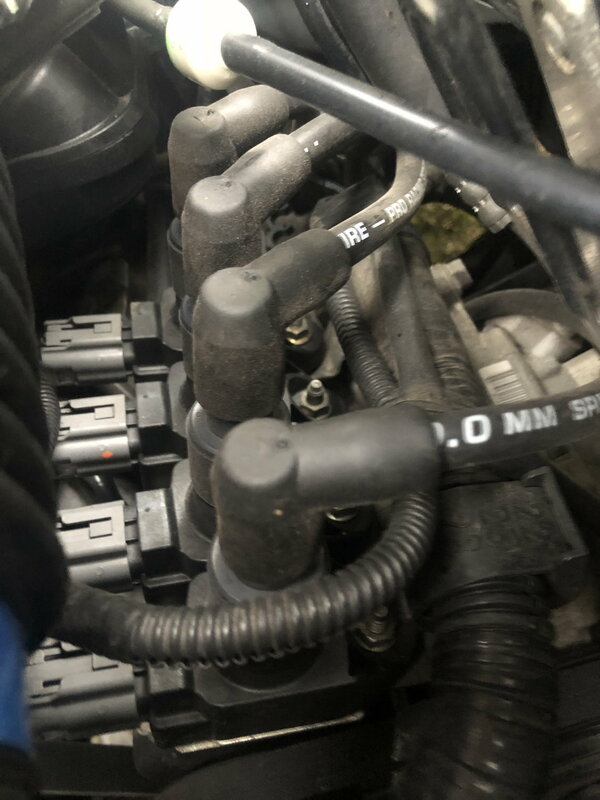 The odd thing about these cars is, there seems to be so many different things that could cause the same symptoms, from a cat, to coils, plugs wires, and even read maybe the MAF etc. I chose the easiest thing and replaced coils and plugs, and a dirty air filter. Store didn't have wires, or I would have done that too. I think I replaced the wires at about 50k anyway. Car gets driven about 5k a year anymore, maybe. Anyway, it runs like new again. It was likely a weak coil. Replaced with Carquest for $35 because they have a lifetime warranty. Now that the car is back on the road, gotta take care of 2 recalls. Air bag and fuel rings(? ), what ever they are. Recently purchased 2007 with 40000 miles. Noticed it has coils and wires replaced and owner kept old coils which are actually C coils. Thought they only came out in series 2 ? Revision C coils can be installed in any RX-8s. They are plug and play. Technically, they first came out on the Spirit Rs(last 1000 RX-8s ever made). Earlier Series 2 actually come with Revision B coils which can still fail. I know the Revision B coils can fail because there is a Series 2 that burnt down. If you look at the picture and OP's comments, they tick all the boxes for failing coils: the fires broke out from the shifter area(not the engine), which is directly above where the cat is. Revision C coils are better, but some accounts say they can still fail. I don't know how well the Hitachi coils hold up. One side COLD, Other side HOT ! Quick Reply: How do I know if I need new ignition coil?